This CLASSY CRUET set is available in both 8oz & 16oz options. 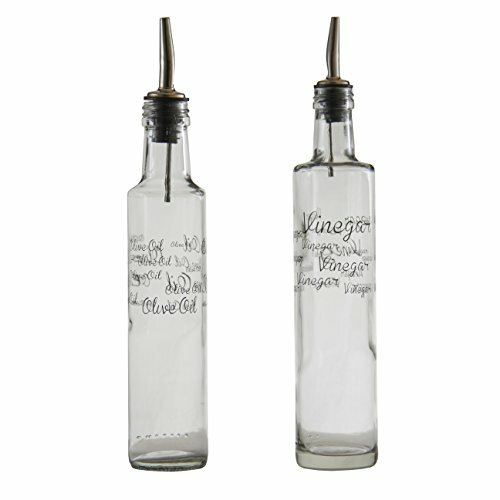 Each bottle is specifically labeled for either olive oil or vinegar to easily identify its contents. Made from QUALITY lead free glass with a stainless steel pouring spout and rubber stopper makes it easy to pour whether using it during cooking or on individual dishes while helping to eliminate spilling. This STYLISH & DURABLE olive oil & vinegar set is made of GLASS which is 100% recyclable does not deteriorate, corrode, stain or fade, so these dispensers r will retain their good looks for a long time. Glass is also inert and free of contaminants, which make it a safe and healthy choice for you and the environment. We are all about delivering quality products and are pretty certain you will be happy with this dispenser set - we stand behind our promises and if at any point you are unhappy with you purchase, let us know and we will make it right. So join the clean, green revolution and BUY your set today. CONSOL - IT'S GOOD, IT'S IN GLASS! If you have any questions about this product by Consol, contact us by completing and submitting the form below. If you are looking for a specif part number, please include it with your message.